Evaluation is an integral aspect to successfully implementing and documenting an initiative. And that’s true regardless of the stage you’re at: submitting a grant, just winning an award, or wrapping-up a project. Our team will work with you to appropriately address the evaluation needs of your project to reflect high ethical and research standards while optimizing the opportunity obtain evidence of impact. The area of evaluation can be quite complex. We’ve distilled this complicated area into four areas of relevance for project owners: Evaluation Plans + Data Collection & Analysis + Reporting Writing = Evaluation. Our work includes these all in tandem or individually. Anyone working intimately with grants can understand how evaluation expectations have shifted over the years. There was a time when an evaluation plan simply involved throwing in words like “formative” and “summative” evaluation. Then, that was enough. Now, reviewers are expecting more. Needing to know the difference between a randomly controlled study, quasi-experimental and propensity matching can be challenging. With millions of dollars often at stake, having the assistance of experienced evaluators writing the evaluation plan can make the difference in your overall score. That’s why more and more grant-writing teams are turning to evaluators to write the evaluation plan for grant proposals. Data collection and analysis is all about gathering evidence of the difference that the project is making. Think of it like this: Every project exists for a reason. And those reasons are the project’s “claims.” Project claims sounds like “this project increases employability” or “more students are graduating because of this project.” But here’s the challenge: Do you have credible evidence to support these claims? By gathering credible evidence the project owners’ can cogently provide support to those claims. Our team possesses wide range of methodological approaches allowing us to craft data collection and analysis efforts that can address the project’s unique needs. While data collection and analysis are about gathering evidence of the project, report writing is about piecing evidence together to tell your project’s story. What are the contextual issues? What worked and what didn’t work? What got the project to this point? Are questions that can be addressed in the report. But tempered within this approach, is the fact that the story cannot go beyond the evidence. In the most ideal situation, the evaluator is brought in early as a partner in order to provide insights as to how to strengthen the evidence. Evaluation is referred to by several different names: external evaluation, third-party evaluation, independent evaluation, etc. What these all have in common is the application of applied social science research methodologies to real projects. Conducting a quality program evaluation does have some additional nuisances such as understanding the requirements of funding agency and the interests of the stakeholders. 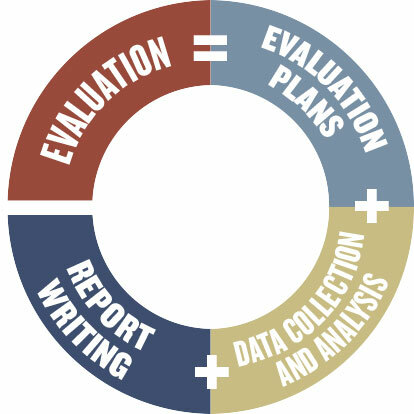 Simply put: Evaluation = Evaluation Plans + Data Collection & Analysis + Report Writing.